The narrow defeat of a populist-nationalist coalition, and in particular the advance of a party advocating Slovak-Hungarian collaboration, could open Slovakia to a better era, says Juliana Sokolova. Any working democracy worth its name can produce unexpected results. What marks Slovakia’s election on 12 June 2010 was not just that it brought a number of surprises - but that rather uncommonly, several of these were pleasant. The most significant overall is that a country whose international political reputation since independence in January 1993 (following the “velvet divorce” with the Czech Republic) was long defined by coarse populist-nationalist leaders may have chosen - albeit narrowly - a different, more liberal and tolerant, path. The initial evidence for this claim is the de facto (though again, it must be stressed, marginal) victory of the opposition parties. Slovakia had been ruled since 2006 by a coalition headed by the clever, smooth, leftist-populist Robert Fico; over these four years his government gained a reputation for political arrogance, clientelism, corruption, lack of transparency, and toxic attitudes towards Slovakia’s minorities (Hungarians in particular, but also Roma). The coalition’s three parties were Fico’s own Smer-Sociálna Demokracia (Direction-Social Democracy / SMER-SD), the vitriolic nationalist Slovenská Národná Strana (Slovak National Party / SNS) and Vladimir Mečiar’s slowly decomposing Movement for a Democratic Slovakia (HZDS). Even months before the election, it had seemed less than likely that Slovakia’s fractured opposition could mount an effective challenge to this gruesome bunch. Yet as the campaign developed, Fico’s increasingly aggressive (even by his standards) press conferences spread a growing conviction that - perhaps, just possibly, this time - those voting for a change of direction might after all be in the majority. It’s true that, in the event, Fico’s SMER-SD repeated its success of 2006 - once more taking the largest share of the vote (and even with a substantial and higher-than-expected increase, from 29% to 34.8%). But what made the situation different is that the four centre-right and right parties that passed the 5% threshold to gain parliamentary seats refused en bloc any deal that would allow Fico to extend his “strongman” approach to governing the country for another four years. Thus, despite remaining leader of the largest party, Robert Fico found himself unable to form any viable coalition. This left him with little room for manoeuvre, since his coalition partners were (in a further wave of positive surprises) rejected by Slovakia’s voters. The HZDS, which stands for all that was corrupt in Slovakia during the era of Vladimir Mečiar’s premiership of the 1990s, had been in terminal decline for years; now, with a mere 4.3% of the vote, it failed even to qualify for parliament. Mečiar’s deeply damaging twenty-year presence in Slovak politics is finally at an end; but the poisonous effect of his era will continue to be felt for some time, not the least in a judiciary pervaded by corruption (reform here must be a priority for the new government). The vote of the SNS, Fico’s other coalition partner, also sharply declined - from 12% in 2006 to 5.07%; a narrow reprieve from political death. The response to defeat of the respective party leaders was characterstic. Mečiar declared that he considers the defeat of the HZDS to be the defeat of the Slovak nation. The SNS leader Ján Slota, as befits the head of a xenophobic party, had often evoked the spectre of war with Hungary, a fellow European Union state; now he warned that the vote represented a step towards the Slovak nation’s elimination, and forecast that it would shed “bloody tears” as a consequence. Here, the pleasant and unpleasant surprises mix: for it was in part Robert Fico’s adoption of the role of “protector of the (Slovak) nation” and his confrontational stance towards Hungary and Slovakia’s Hungarian minority that allowed him to swallow much of the nationalist vote that previously had gone to the SNS and HZDS - sapping life and votes from them, securing a rise in support for his SMER-SD, yet also leaving him with no one else to rule with. A twisted echo of Fico’s achievement, and a far more clearly negative election surprise, was the result achieved by the ultra-nationalist political wing of the neo-nazi National Guard in Slovakia’s poorer northeast (up to 4% in some areas). 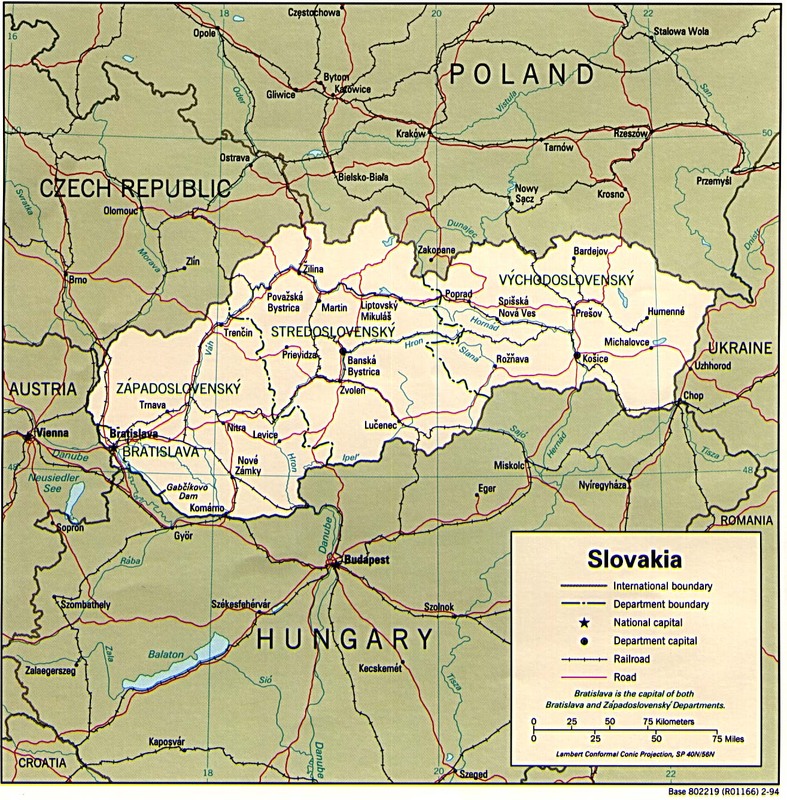 The east of Slovakia is not a traditional nationalist stronghold and the focus on Slovak-Hungarian tensions hasn’t had a significant appeal here. However, it is the area where the majority of the country’s Roma population lives, and the National Guard’s strategy has been to move into the region and attempt to exploit the grievances of sometimes already deeply divided rural areas. This seems to have brought its fruit. But the election brought more positive news at the centre of politics. The four centre-right and right parties, sharing a commitment to launch the country on a new course, won a slight majority of seventy-seven seats against the seventy-one held by the SMER-SD and SNS. The performance of the old centre-right stalwarts, the Slovenská Demokratická a Krestanská Unia (Slovak Christian Democratic Union / SDKÚ (15.4%) and the Christian Democrats KDH (8.5%), was fairly mediocre; but two new parties scored significant successes. These are the socially liberal and economically neo-liberal Sloboda a Solidarita (Freedom and Solidarity / SaS) (12.1%), which projected itself as a dynamic, internet-savvy party, focusing its campaign on the overriding need for economic reform; and Most-Híd (8.1%), a party of Slovak-Hungarian cooperation formed by Béla Bugár after he split with the Strana Madarskej Koalicie (Hungarian Coalition Party / SMK), on the grounds that the leadership of this party of Slovakia’s Hungarian minority had become increasingly (and needlessly) confrontational. Most-Híd’s very name - meaning “bridge” in Slovak and Hungarian respectively - is a signal of its explicitly conciliatory intentions. And it is this - the choices made by Hungarian-speaking voters, members of Slovakia’s largest national minority - that represents the most exhilarating of the surprises produced by the 12 June election. After a year and more of heavy and stifling polarisation in Hungarian-Slovak political relations, Slovakia’s Hungarians have decisively shifted their vote from the SMK (whose 4% meant it failed to enter parliament) to the forward-looking Most-Híd. This also sends a clear message to Hungary’s prime minister Viktor Orbán, elected on 11 April 2010 (after eight years out of office) - and to Hungarian political leaders in Slovakia: that Slovak’s Hungarians want none of the political agendas and rhetoric that threaten to destabilise good relations between people in the country (see Anton Pelinka, “Hungary’s election, and Viktor Orbán’s choice”, 15 April 2010). In this respect, Béla Bugár’s decision to define his party as one of “Slovak-Hungarian collaboration” - rather than as a new representative of Slovakia’s Hungarians - has proved wise; for it also appeals to many Slovaks fatigued by years of manufactured tensions, and who trust Bugár’s established image of civility and politeness. A difference in the two parties’ election campaigns was striking and symbolic: while the SMK ostentatiously opposed the Fico government’s language law by publishing their materials and holding political meetings only in Hungarian, Most-Híd opted for strict bilingualism in its publicity and at all its events. A month of post-election manouevring that began with President Ivan Gašparovič (respecting Slovakia’s constitutional proprieties) giving Robert Fico ten days to try to form a government ended with the as-yet untested Iveta Radičová of the SDKÚ installed on 8 July 2010 as Slovakia’s first female prime minister. The new government, keen to inaugurate a new “clean” era, has to manage a baleful legacy (the economy, the judiciary, dubious tenders, relations with Hungary) in order to create the change it promises. A careful internal balancing-act will be needed to sustain the coalition. There will be more surprises round the corner.